The porch is the calling card of the house. In addition to the functional purpose, this design performs a protective function, as well as decorates the facade of the building. 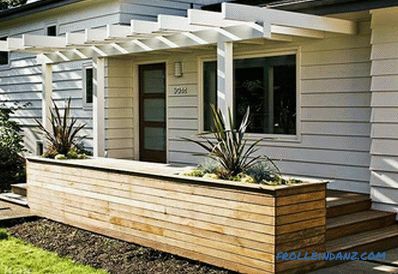 At the same time the porch can be made of different material and have a various form. 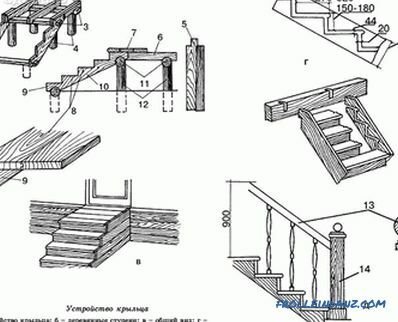 In the article we will talk about how to make a porch of wood with your own hands, we will show diagrams, drawings, photos and video footage. The usual (simple) porch . 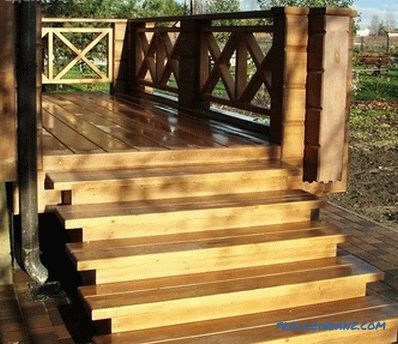 It consists of a small number of steps, while the risers can be either open or closed. 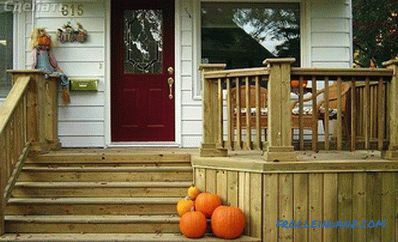 Such a porch can be built with or without handrails. It has a simple appearance, there is no wide flooring. Porch - Patio . It has an original appearance and is characterized by beautiful forms. Such a porch has a special platform on which flowers or other elements of decorative structures are placed. Can be equipped with a small playground. Porch - terrace or Veranda has a rather complex shape. It connects with the open part of the house, has a seating area. Built-in porch . It is being built together with the house, it has a common foundation with it. 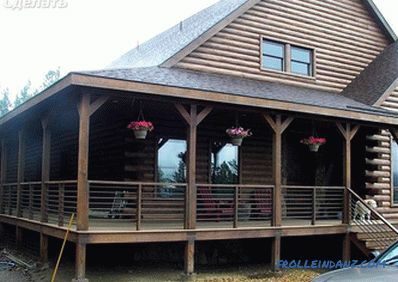 This type of porch is designed in conjunction with the building, each element of the building is thought out. Attached (attached) porch . Built separately from the building itself. You can do in the process of operation at home. It is a separate construction, which in a certain way joins the house. 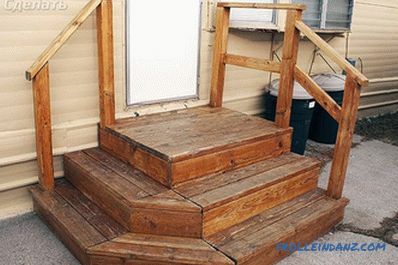 It is quite possible for everyone to build a porch. When carrying out construction work, it is important to follow the rules and safety. 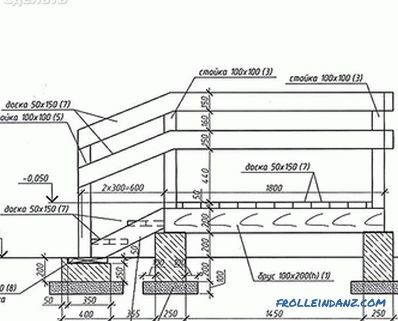 First of all, you need to make a drawing of a future structure. Drawing can be done independently or order it from experts. 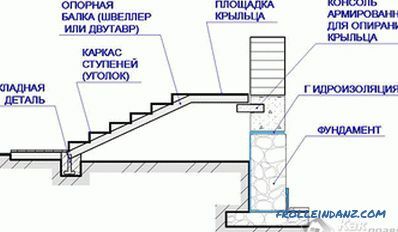 The drawing of the porch should have a general view, the dimensions of the flight of steps, the landing, the railing and the stair flights. When designing, it is necessary to immediately consider what material will be used. 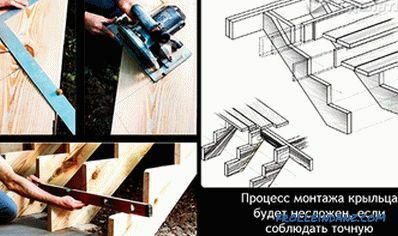 If the porch will have a large cross, then it is better to use a stronger wood. 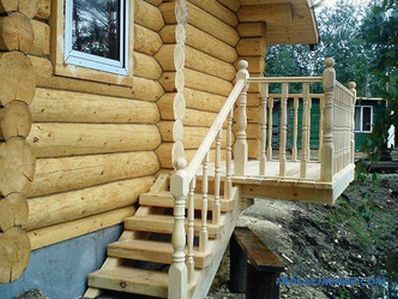 For a small family, you can make a porch of pine. It is important to consider what protection against precipitation will be provided, for example, you can use a roof or a roof. The construction site should not interfere with the opening and closing of doors, while there should be enough space on it to allow movement of several people. Before the start of construction work, it is worth deciding which height of steps to use is best. Consider the design and appearance of the porch. 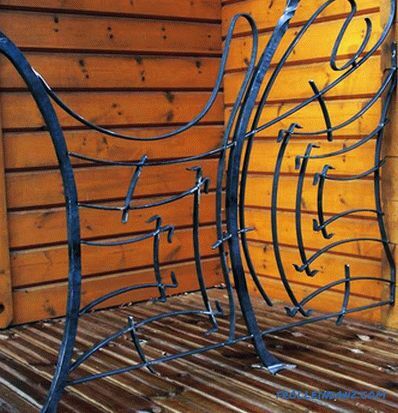 This design should fit harmoniously into the exterior of the house. 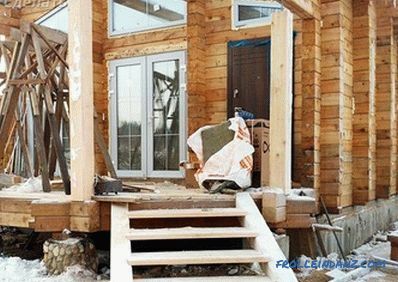 After the preparatory work is completed, you can safely proceed to the construction of the porch. 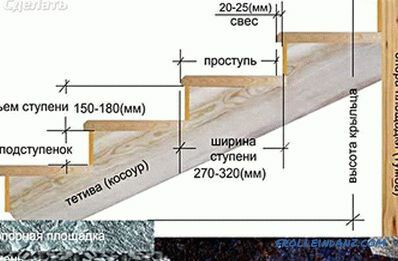 Timber with a section of 10 * 20 cm for supports. Although in most cases the size of the support bar is selected individually. 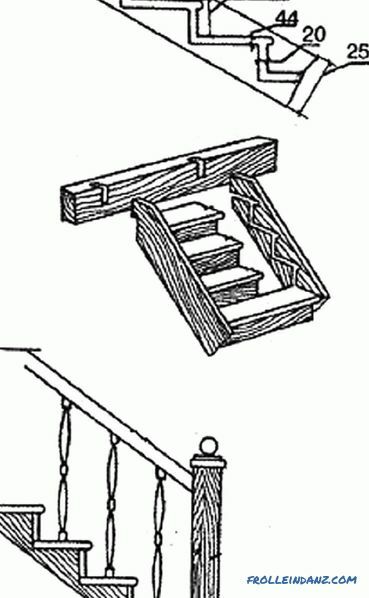 The choice depends on the degree of load on the structure. 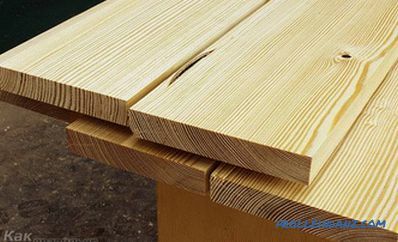 As for the wood itself, it is preferable to choose larch or pine. They contain resins that allow wood to withstand adverse environmental conditions. Boards 3-5 cm thick for flooring. Blanks for balusters and railings. If there are none, then you should purchase a bar / rail for their manufacture. 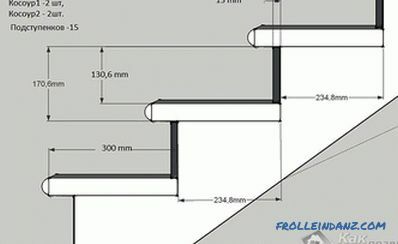 Dimensions depend on the design parameters. Impregnations, solutions and special compositions for wood impregnation. 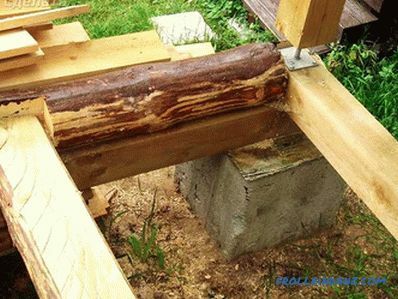 The base of the kosour must necessarily have an emphasis on waterproofing, which is located between the kosour wood and the foundation. 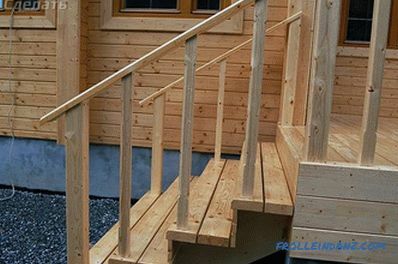 For supports it is better to take coniferous wood, especially if you live in an area with high humidity. 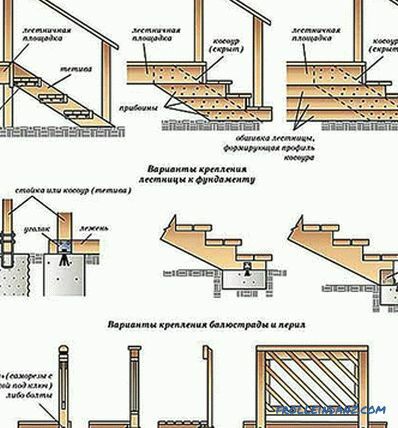 The columns of the support should be treated with an antiseptic against rotting In this case, it is not recommended to use roofing iron, as it does not allow air to pass through, and this leads to rotting of the wood. 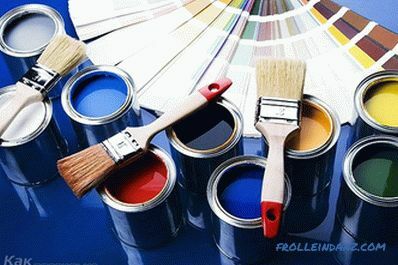 Therefore for processing it is better to use waste oil or linseed oil. The depth of installation of the column is up to 80 cm. On average, the depth of the support can be inserted in 1/3 of its length. 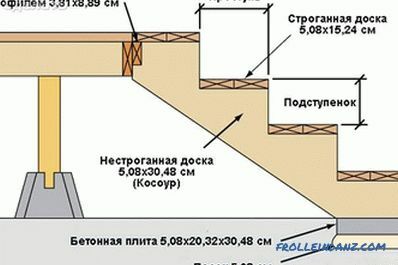 If the construction according to the plan is massive enough, then the supports should be installed more, for better stability. Each support must be filled with concrete. After it dries, check the height between all the pillars. 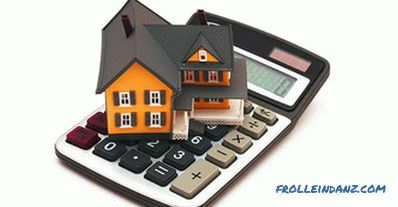 If there is a drop, then it is necessary to eliminate it by filing. After that, you can lay down the lag on the supports. If possible, fasten the top edge of the kosour onto the railway tie. 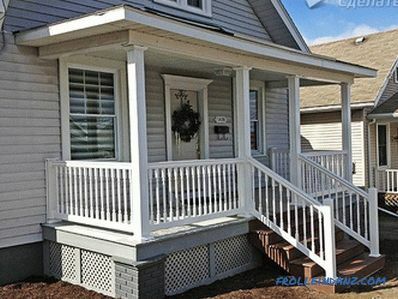 The principle of building a porch to a brick or wooden house is identical. In any case, it is worth making a qualitative binding of the porch to the building. 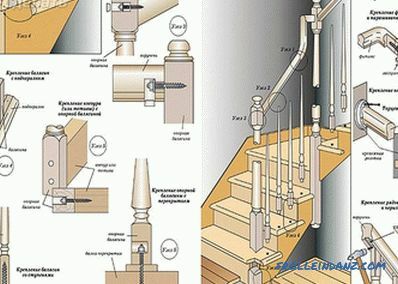 As for the steps, everything is very simple. 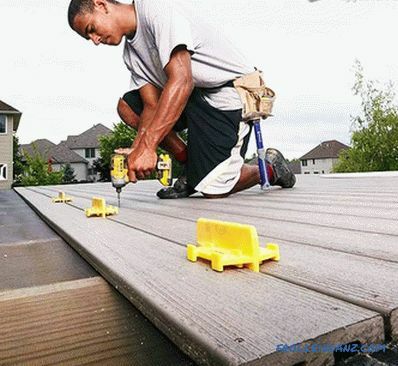 Boards are laid on logs and fixed with nails or screws. The method of their installation may be different. For example, boards are fitted close to each other so that there are no gaps between them. 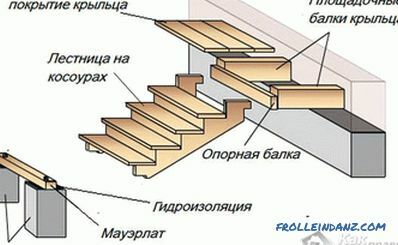 In this case, the slope of the porch will have from 1.5 to 2 °. This will be enough so that the water does not accumulate, and flow. Another method of laying is to leave gaps up to 3 mm between the boards. 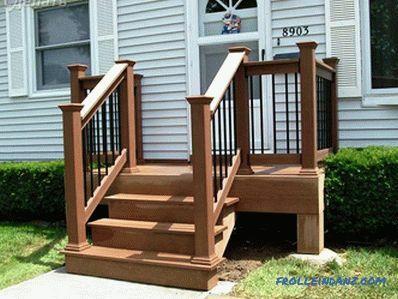 This will allow the water to immediately flow down, not lingering on the surface of the porch. The last method of laying flooring has its drawbacks, which is associated with the risk of injury. This applies to those cases if the beautiful half of the house wears stiletto heels. You need to start installing the steps from the bottom of the bowstring / kosour. Self-tapping screws are used for fastening, the caps of which are buried in the wood. First of all, the risers are set, and after the steps themselves. 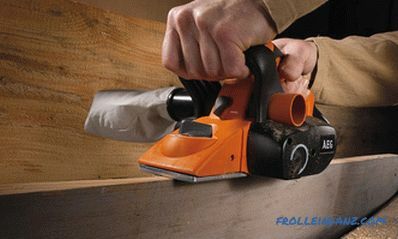 If your steps are on a kosoure, the attachment is carried out directly to it. 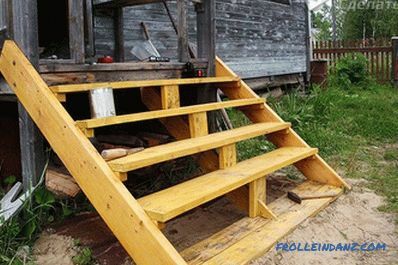 When the steps are ready, you should worry about safe movement on the porch, having built a railing. They can also be made of wood. 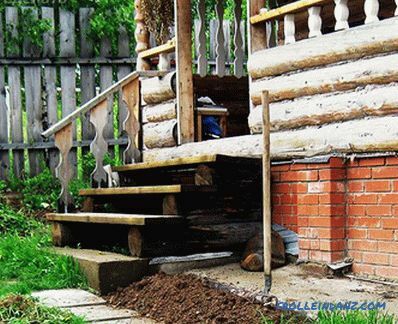 Especially fences on the steps are necessary if there are more than three steps. The fence for the porch can be made of forging, stone or brick. In this case, it will look more monumental. Be sure to provide additional security features. This includes anti-slip coating, which can be made of rubber, rubber, etc. 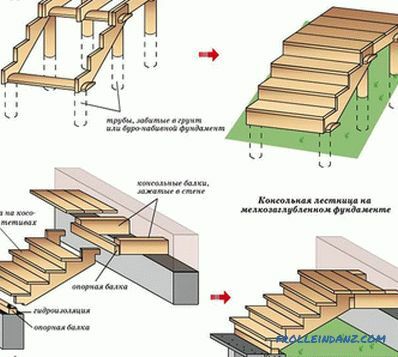 This is very important, because the frozen water makes movement on the porch and steps unsafe. 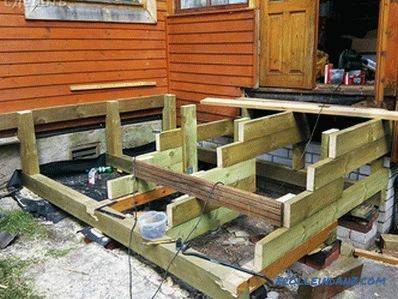 So, making a porch from wood is one thing. It is quite another to provide him with a long operational period. 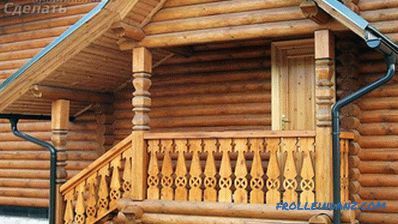 It is about the means of protection of the porch of wood, we'll talk further. 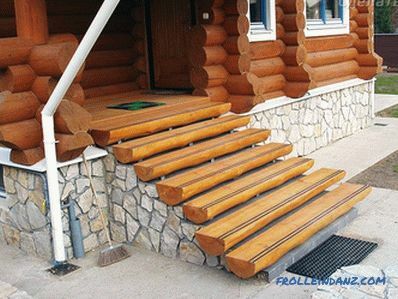 To organize the protection of the porch and steps, it is worth making a carport. 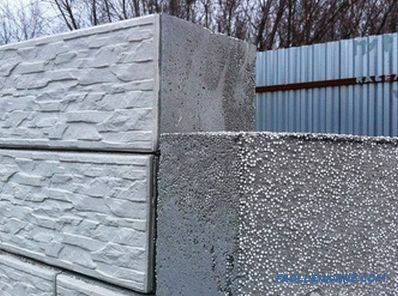 It will prevent the ingress of snow, rain and direct sunlight. All of this has a negative effect on wood, especially with constant exposure. If the porch is small, then it will be enough to build a small visor. For the roof of the canopy / canopy, you can use different materials of corrugated board, polycarbonate, tile, etc. When decorating a canopy or canopy, it is important to ensure that the support pillars do not interfere with movement. 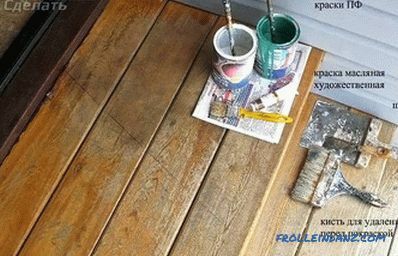 In addition, wood treatment is recommended from time to time. 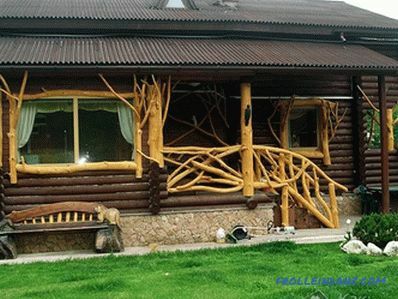 In this case, it will be possible for a long time to do without overhauling the porch. 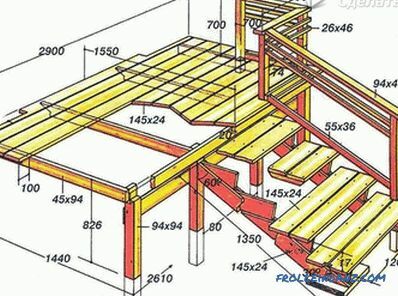 This is how the wooden porch is made. 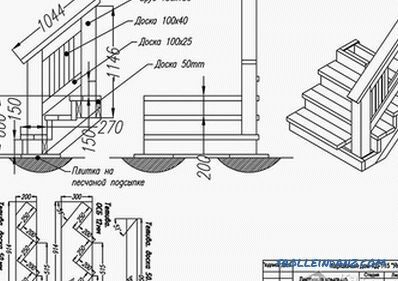 If you already have experience in the manufacture of such a structure, then leave comments at the end of this article. 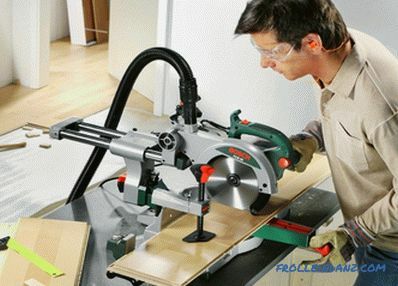 If you are a novice master, then the diagrams and photos provided will help you design and do all the work yourself. We also invite you to view the prepared video.